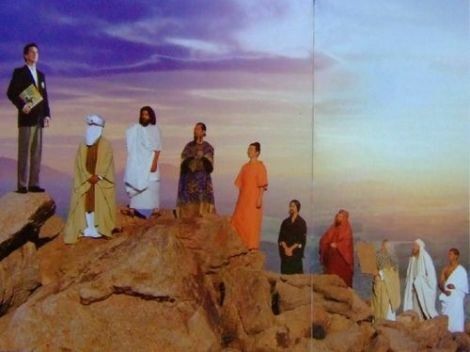 This Scientology tract features a photo of the world's religious icons, from Muhammad to Jesus to Moses to Confucius (?) standing in awe beneath an usher who also happens to be a Scientologist and is therefore the most powerful God. Kansas City's alt-weekly The Pitch has the scans, and points out that depicting Muhammad is something of a no-no in certain parts of the Islamic world, especially when he's clearly depicted as subordinate to some guy in a blazer. Shouldn't Scientologists know better than anyone what can happen when you screw around with violent, angry, religious zealots who brook no dissent and will stop at nothing to defend their twisted authoritarian cult?